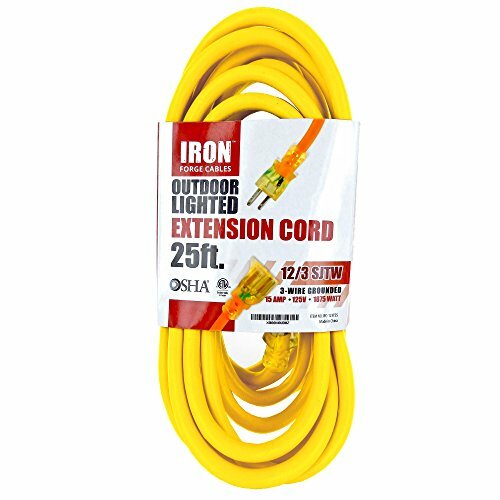 Iron Forge Cables' 25 Ft Outdoor Extension Cord is the perfect all-purpose power cord for your indoor and outdoor electrical needs. The heavy duty 12 gauge wire can handle everything from power equipment to everyday appliances. And the cord's 25 foot length gives you great reach across your garden or home. ETL and CETL Listed. Whether you want to power a leaf blower, lawn mower, pressure washer, weed whacker, electric drill, power saw, or even Christmas lights, this extension cord is designed to meet all your outdoor needs. The vinyl covering protects the cable against moisture, abrasion, and sunlight. The cord's yellow color is highly visible for extra safety. And the plug offers reinforced prongs that won't bend or break when you use them.